The 2017 Harley-Davidson&reg Road Glide&reg is available now at Rawhide Harley-Davidson&reg as part of the iconic Harley-Davidson&reg Touring lineup. 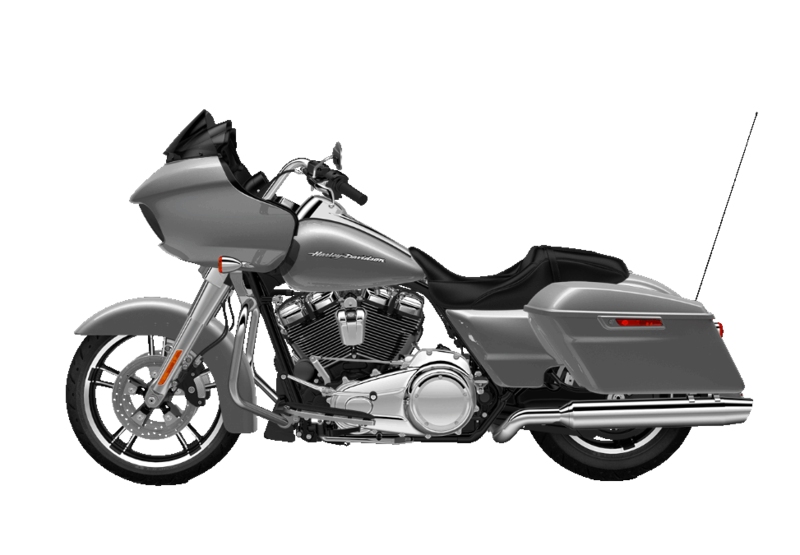 The new Road Glide&reg is a classically styled touring bike with plenty of impressive convenience features. It’s also more powerful than ever thanks to the new Milwaukee-EightTM engine. 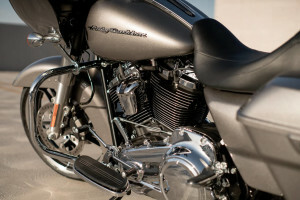 Find it here at Rawhide Harley-Davidson&reg, your local Overland Park dealer. 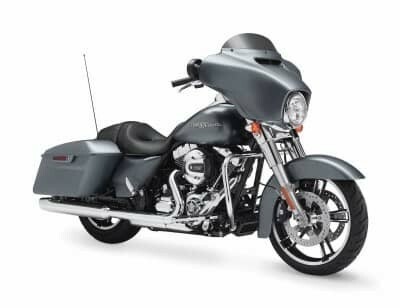 The Road Glide&reg is designed to provide the kind of touring feel you want, and our top engineers have created a bike that’s convenient, attractive, and stylish. High Output Accessory Connector: Go ahead. Connect your heated seats, heated vests, or even recharge your tablet. 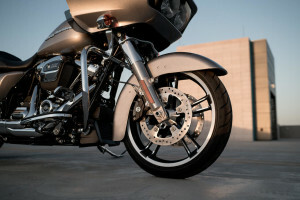 The Road Glide&reg can handle it. One Touch Fuel Door: It only takes a single touch to open up the fuel filler door on the Road Glide&reg, making refueling the generous tank a breeze. 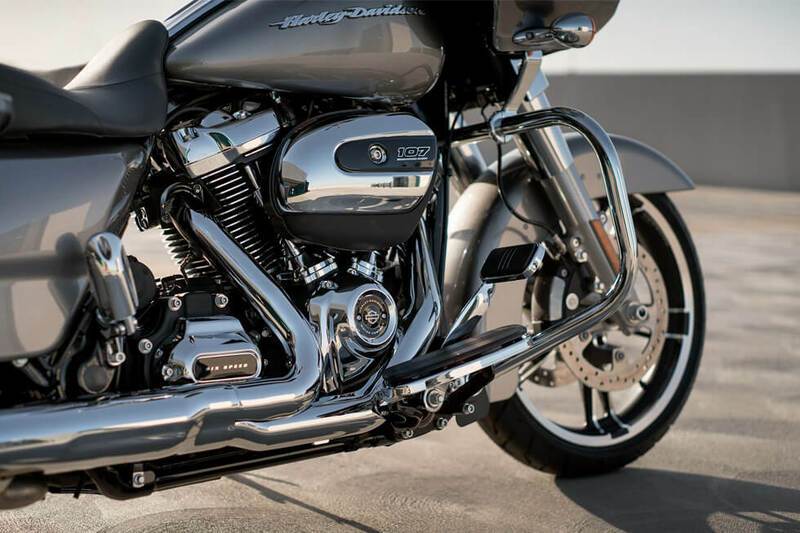 Standard Cruise Control: All touring models from Harley-Davidson&reg get cruise control, which helps take the edge off those long stretches of the prairie. 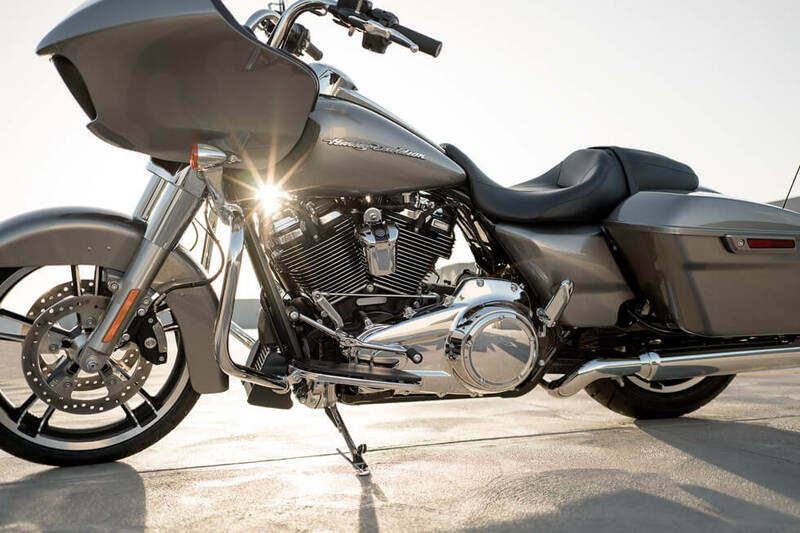 Handlebar: With a generous sweep back, the handlebar on the Road Glide&reg puts the controls closer to you, so you can sit back, relax, and soak in the scenery. 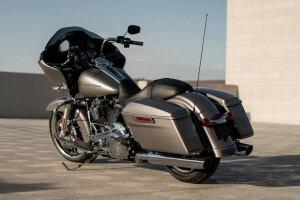 The Road Glide&reg provides the confidence and control you need to take on the longest rides from Lenexa with ease. 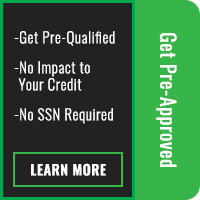 It also features plenty of systems that add safety, security, and comfort. 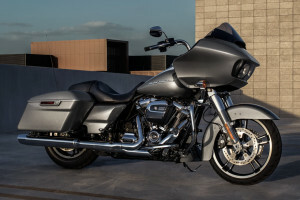 All-New Milwaukee-EightTM 107: The new Road Glide&reg is powered by the next-generation of Harley-Davidson&reg V-Twin engines. With four valves per cylinder, and 107 cubic inches of displacement, this is one of the most powerful engines ever strapped to a Harley-Davidson&reg. It delivers faster acceleration with a smoother, cooler ride, for the ultimate touring powertrain. Milwaukee-EightTM Overview: Somehow Harley-Davidson&reg engineers managed to bump up power, while improving heat management, and ride quality. They used a new exhaust system and counter-balancing to reduce heat and vibration. A higher compression ratio helps improve performance. Less mechanical noise provides a purer, cleaner exhaust note. Six-Speed Cruise Drive&reg Transmission: You’ve got the power to control the bike’s V-Twin with the Six-Speed Cruise Drive&reg. It makes shifting a breeze, and with a tall top gear you can enjoy low engine rpm at high speeds. Dual DaymakerTM Reflector Headlamps: If you want brightness, you’ve got it. This lighting setup provides more light, more spread, and more reach so you can see the road ahead even during the darkest night. Brembo&reg Brakes: You’ve got three Brembo&reg brakes: two up front, and one out back. That’s the level of stopping performance you want when you’re piloting a big bike that’s fully loaded. Dunlop&reg Multi-TreadTM Tires: These high tech tires are engineered to deliver awesome grip in all conditions. They provide both confident handling and plenty of agility on any road. ReflexTM Linked Brakes with Anti-Lock Braking System (Optional): Want even more stopping power? You can upgrade to this sophisticated anti-lock braking system that prevents wheel lockup. High Flow Airbox: Why do you want high flow? When your engine can breathe, it makes more power. It’s that simple. This high flow unit swallows more air and looks good doing it. 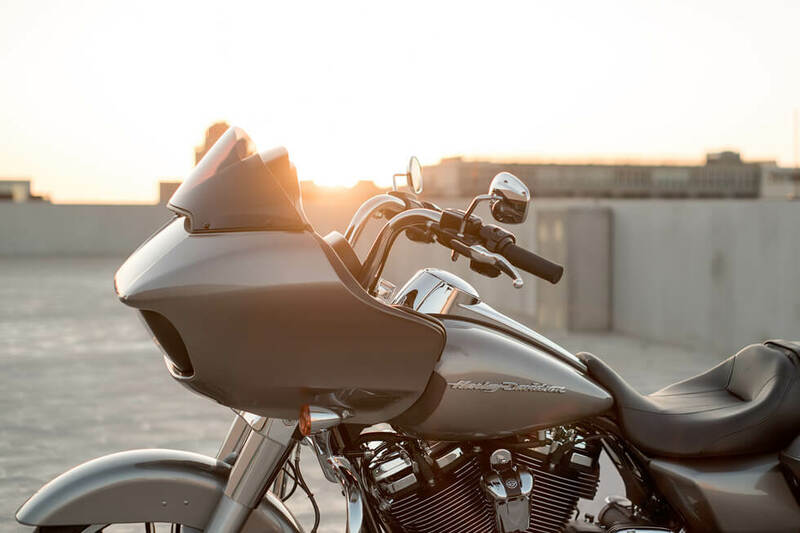 Ergonomically Designed Hand Controls: With your hands in the right place you can ride all day, and with the bars on the Road Glide&reg, you’ll want to. You’ve got every control you need, from turn signals to infotainment controls, right on the hand grips. Steering Head and Front Forks: Up front, you’ve got a huge 49mm pair of front forks that provide confidence when diving into a steep curve. 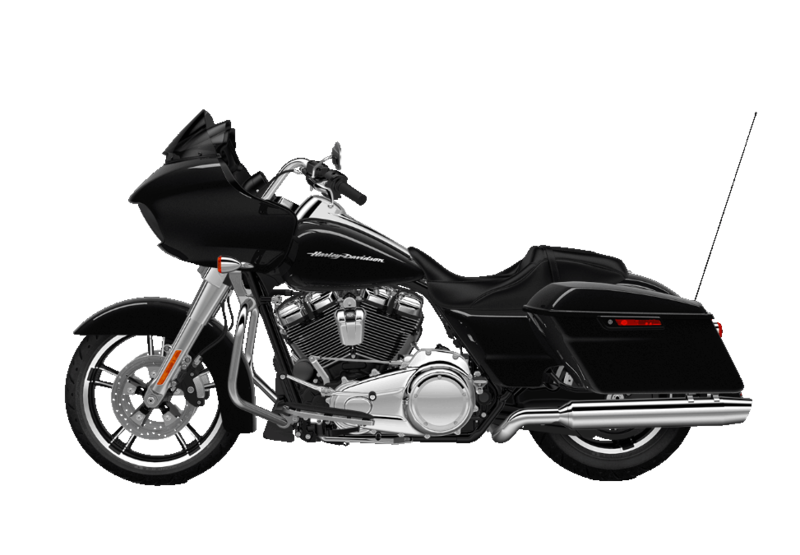 H-D&reg Smart Security System: This factory installed system helps protect your bike. It wirelessly activates when you walk away from the bike and deactivates when you approach. 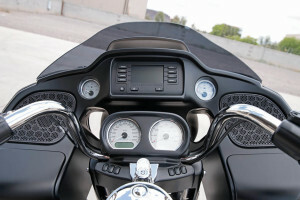 The Road Glide&reg comes standard with the latest infotainment features. Superior Infotainment: This is a contemporary system that rivals any equivalent in a car. It gives you GPS, phone connectivity, music, voice activation, and more. 5.25-inch Speakers: You’ve got a set of dual 5.25-inch speakers mounted securely up front, ensuring you enjoy ample volume when you’re out there on the road. Ready for Upgrades: It’s convenient and easy to upgrade to a larger 6.25-inch speaker if you need more volume. Larger Buttons for Easy Operation: These buttons were designed around your gloved hands, so it’s easy to take advantage of all the infotainment features while you ride. Boom!TM Box 4.3 Radio: You’ve got more volume, less distortion, and superior sound when you’re on the Road Glide&reg. It’s the perfect way to ride to your own soundtrack. Jukebox With USB Port: It’s easy to connect your smartphone to your Road Glide&reg with USB connectivity and an SD Card reader. 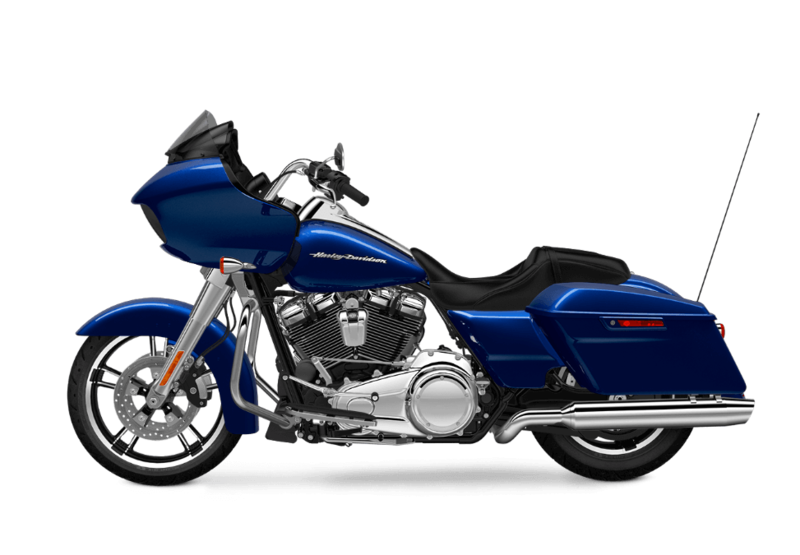 The Road Glide&reg is a very attractive touring bike that’s designed to turn heads wherever it takes you. Single AM/FM/WB Antenna: Why have more than one antenna when one can do it all? Good question. 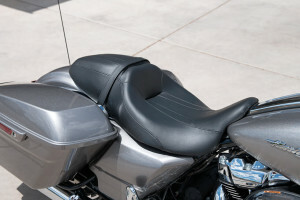 That’s why there’s only one antenna on the Road Glide&reg. 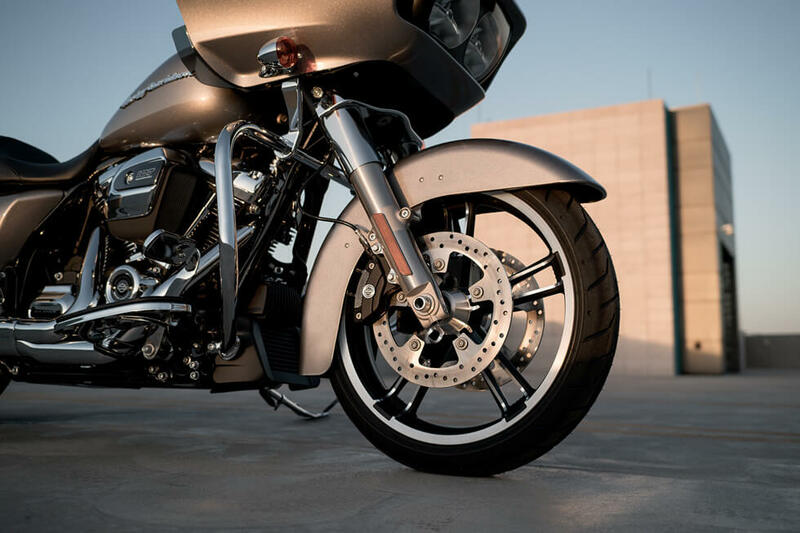 Bullet Turn Signals: You want everyone to see that you plan to turn or merge, and that’s why we’ve put these elegant but bright turn signals in back of the Road Glide&reg. 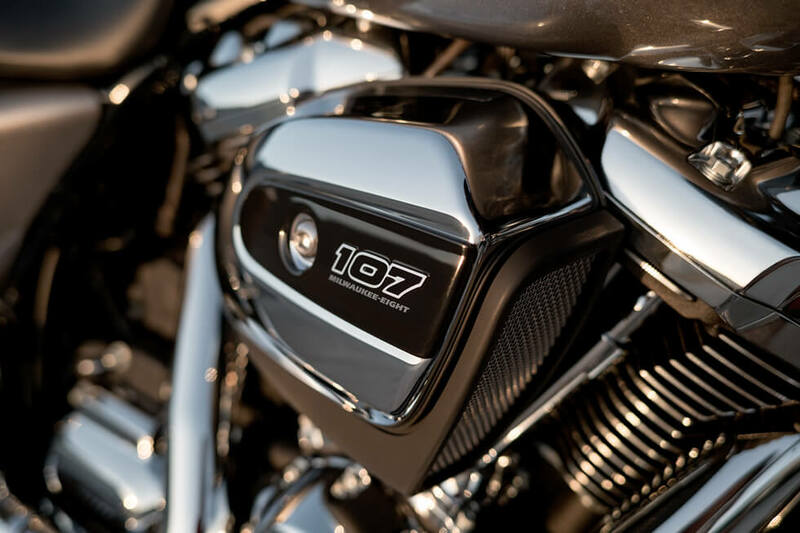 Pure Harley-Davidson&reg Style: The distinctive 107 badging on the new Milwaukee-EightTM makes it clear where your allegiances lie. 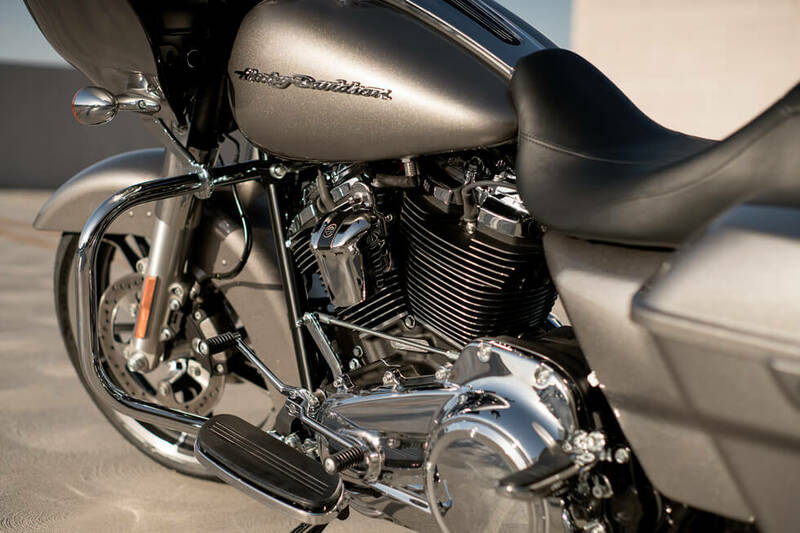 This new engine is just as beautiful as it is powerful with chrome covers, machined cooling fins, and a racing scoop style air filter cover.